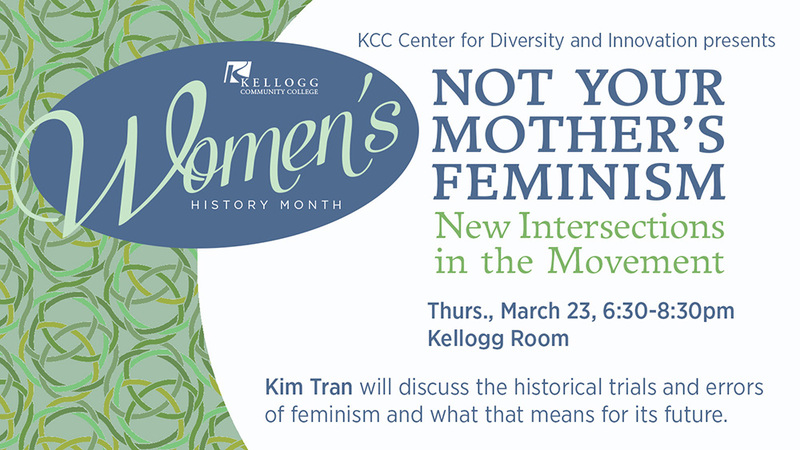 The Center for Diversity and Innovation at Kellogg Community College this month will host feminist speaker and writer Kim Tran for a discussion about the future of feminism. “Not Your Mother’s Feminism: New Intersections in the Movement” will run from 6:30 to 8:30 p.m. Thursday, March 23, in the Kellogg Room of the KCC Student Center, on campus at 450 North Ave., Battle Creek. The event is free and open to the public. From the women’s liberation movement to breaking the barrier of the glass ceiling, many are familiar with the stories of feminist activists like Gloria Steinem and actress Emma Watson. But with critiques launched against mainstream feminism by many women and people of color, Tran will discuss the view that feminists themselves are left asking how the movement can be more inclusive, vibrant and accessible to everyone. Tran will also discuss the historical trials and errors of feminism and what they means for its future. Tran is a teacher, scholar and organizer finishing her Ethnic Studies Ph.D. in Women, Gender and Sexuality at the University of California, Berkeley. Her scholarship and community work engages the intersection of cross-racial coalitions, gender inequality, class oppression and queer sexuality. Kim has worked extensively with the LGBTQ Youth Space; is a collective member of Third Woman Press: Queer and Feminist of Color Publishing; and is member of TheatreFIRST, a storytelling initiative in residence at Berkeley’s Live Oak Theater. She also publishes writing at “Everyday Feminism” and currently facilitates anti-oppression workshops for universities, nonprofits and community based organizations. For more information about this event, contact Timeaka Reese, executive assistant at the KCC CDI, at reeset@kellogg.edu. Please note: The KCC CDI seeks to be as inclusive as possible in all its events, and asks all guest to be fragrance-free. Please contact Sara Johnson at johnsons@kellogg.edu or 269-565-2107 with any accessibility requests.